Hi girls! This week I have a brand new fabulous giveaway for you in conjunction with Aspire Style. After my popular post last month on the goodies I bought when out shopping in Stratford upon Avon, Aspire Style have kindly offered to run a giveaway for my readers. 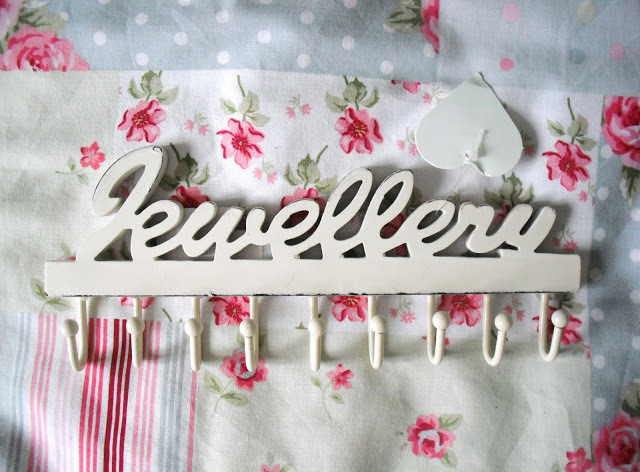 You could win this gorgeous shabby chic style jewellery hanger, just like the one I bought! Mine now takes pride of place above my dressing table, draped in all my dainty jewellery pieces. They will also throw in a few more surprise goodies! 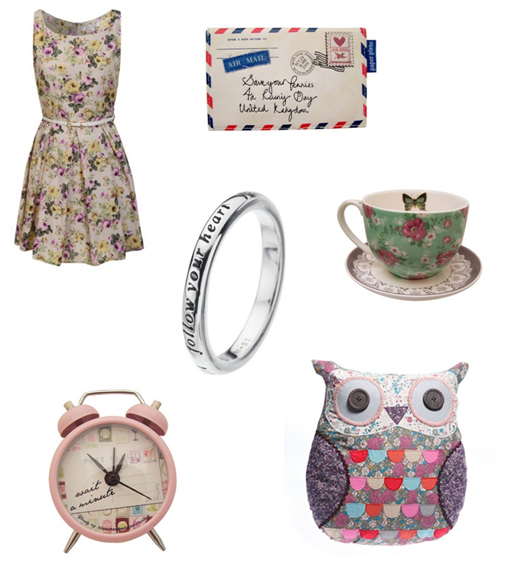 Aspire Style sells irresistible fashion, jewellery and gifts at affordable prices. Their products are all a little bit different, such as vintage-inspired clothing. They have four beautiful stores throughout England: Stratford upon Avon, Warwick, Oxford, and Solihull. If you live near any of those locations, I really recommend that you pop in and take a look around. They have also branched out into being the perfect one-stop-shop for vintage style wedding bridesmaids dresses and accessories. These are just some of my favourite products that they stock. Including the cute owl cushion that I showed you the other day! They sell some of my favourite brands including: Virtue jewellery, Louche fashion, and Disaster Designs. Take a look at their wonderful interiors and dainty gifts. Check out their website here, and also their new vintage style bridesmaid online store here. To claim a 10% discount on either of these stores, just enter code VICTORIA at the check out (expires 31st May). To enter the giveaway to win the jewellery hanger and extras, please just leave your name and email address (or Twitter name) as a comment underneath this post. I will pick a winner at random next weekend! Good Luck! This is gorgeous! I've always wanted one of these but never seem to pick them up. Great giveaway and I'd loved to visit that shop, I have a hat box just like one of those pictured. This is so adorable, I'd love to enter. I also have a giveaway atm on http://www.topazandmay.blogspot.co.uk! So many lovely things! Unfortunately I'm down south so can't visit any of the stores. I'd love to pick up some things for my bridesmaids for my wedding in June. We're hoping to do a vintage inspired photoshoot. this would be so handy, I love the 3 tier cake stand in one of the bottom photos! Such a cute store! Lovely little pieces! I could really do with something like this – my jewellery is a mess!! Im in awe with their shop, hw cute. Im in love with shabby chic/vintage stuff at the moment and currently decorating my bedroom in this theme, so this would be perfect to have all my necklaces hanging from. I've always noticed this in the back of your photos and thought it was gorgeous and super handy. Wow, everything is so cute and pretty! This is a great giveaway and this shop is exactly my type of shop! A perfect place to keep your jewellery, also i love the ring. Gorgeous giveaway! Shame there's not a store near me, I love the cake stand! Oh that is gorgeous, I love the shabby chic look! this would look lovely in my room! thankyou very much for the giveaway! Gorgeous, would love to win! Definitely my kind of shop – beautiful goodies! 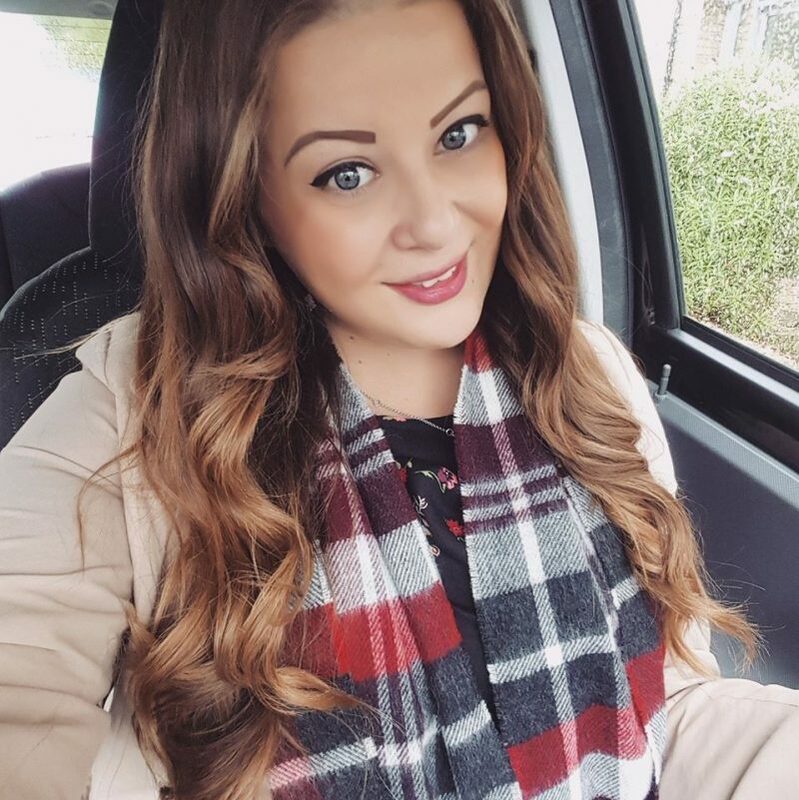 Found your blog last week and love it! I'd also want to win! Been after one of these for my necklaces for ages and would go great in my bedroom! This is an amazing giveaway!! Definitely going to look at this shop in Warwick sometime this week!! Ohhh that is lovely! I wish I had more vintage things!! omg, they're all so gorgeous! Hi dear..Thanks for the give away…Enter me pls.. This is soo beautiful, i would love to enter! Great giveaway. Would love to have this. Love all the Aspire style goodies and pleased to discover your blog too! Please enter me as my jewellery is in desperate need of some organisation!!! Gorgeous, so pretty, would love to beautify my room with these :). Thats so pretty, I had one similar to it, but mine dropped off the wall and broke! This is gorgeous and looks perfect as my jewellery is always getting tangled!